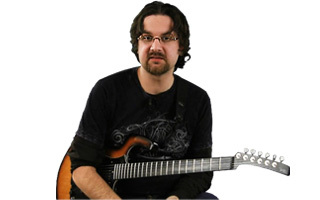 Many guitar players rely on picking each note that they play to blaze through the fretboard. The most important thing to keep in mind while practicing the following techniques is to be as precise as possible. Many guitar players can pick fast, but picking with precision demands much more dedication. 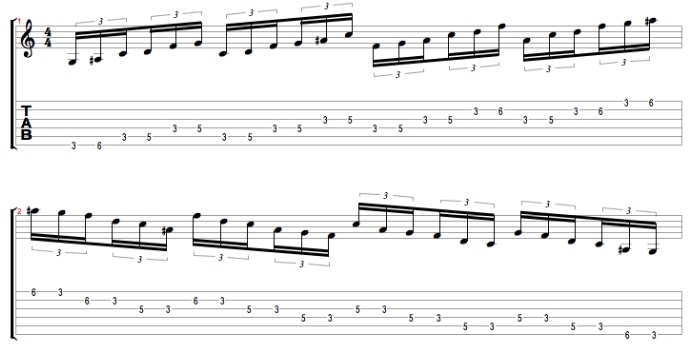 This section is designed to help you develop a strong consistent picking technique no matter how long you have been playing. One of the most common questions when starting to seriously practice alternate picking concerns the guitar pick. Several ways to hold it have proven themselves to be effective. If you've been playing for a while and are comfortable with the way you hold your pick, don't worry about relearning your position. Many positions are valid and you should consider the following approach only if you encounter problems in your playing. Hold your pick between your thumb and your index. Your index should be slightly curled. Only a small surface of that pick should be in direct contact with the strings. This will facilitate your precision and give you more control. While actually picking the strings, try attacking them at a 45 degree angle. This will insure you better success when playing faster licks as you will have less resistance when playing. - Always alternate up and down strokes. - The movement should come from your wrist, not your elbow. - Start very slowly and start speeding up when you feel comfortable. One of the most important aspect of picking is muting. Making sure that no unnecessary strings are heard while playing will make you sound much better. Muting comes from both hands. The palm of the right hand is useful to mute all the strings placed below the fretted note. The index of the left hand will be used to mute the strings placed above your fretted note. The following exercises are designed to train your fingers in that matter. 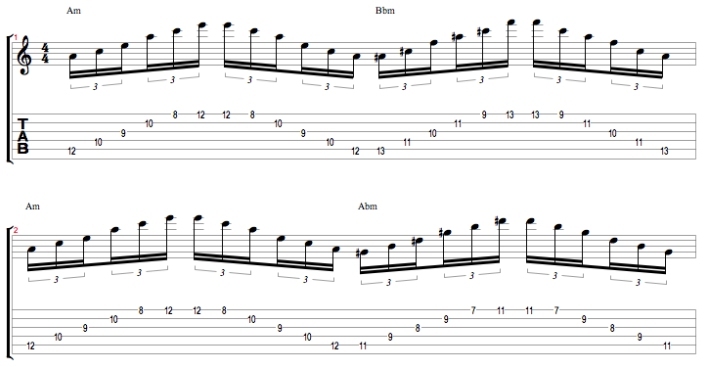 Make sure to use alternate picking for each note played and play this exercise very slow first. The goal is to program your fingers to hit each string with precision and clarity. Playing fast with accuracy requires your fingers to be very comfortable in any given situation. In this section we will work on little exercises designed to prepare your muscles to respond effectively. Don't skip this step as it will enable you to play longer and faster. Remember to pick everything using alternate up and down strokes. While working on these, try to use a single finger per note played. In order to play fast, your fingers need to be comfortable in any given situation. Training your fingers to move independently from each other is key in order to master the art of playing fast efficiently. The following two exercises will help you in that matter. They both are based on triads and can a lot of melodic appeal to your leads if played precisely. 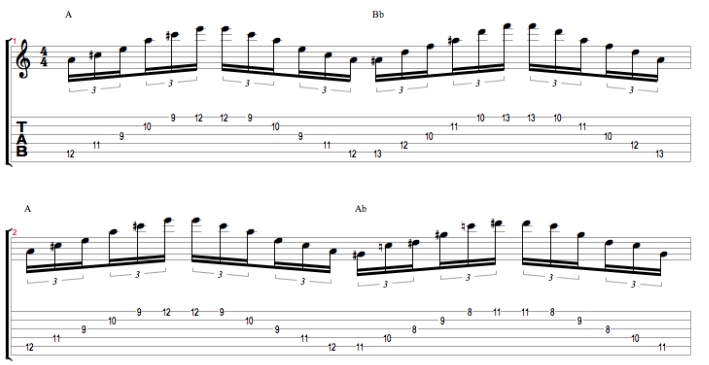 Using sequences in your playing can help you develop a strong alternate picking technique. These sequences should follow a logical formula allowing your fingers to follow that pattern across the used scale. As you work with the following ideas, keep a straight alternate picking technique. Stay as relaxed as possible and be patient. Starting at a comfortable speed will help you clean up your technique. Remember to keep a consistent tempo. Remember that cleanness is the most important aspect of picking. Practicing at a very comfortable speed is the only way to learn correct finger placement and precise playing. Be patient and don't give up. Always remember that speed in itself is of no value. Speed is only a tool that enables you to express yourself with the instrument.